Tasting Notes: dried apricots, subtle smoke and woodsy. 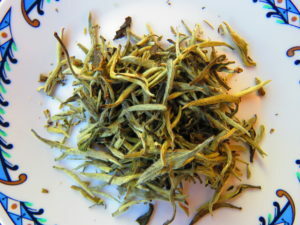 Bai Hao Yin Zhen Silver Needle is classified in the top ten superior Chinese teas! It is grown and produced in the northern district of Fujian province in China. A beloved Chinese favourite, the western world is just beginning to appreciate this fine treasure! Picked in the early April harvest, our Bai Hao Yin Zhen Silver Needle is a premium young white tea. Our luxury young silver needle tea is delicate, and a refined tea drinking experience. It has a naturally sweet taste similar to dried apricots, and a slight smoky, woodsy fragrance that complements its light body. Bai Hao Yin Zhen Silver Needle is renowned for its wide range of health benefits! The stresses of daily life and a poor diet can bring about early signs of aging but white tea may reduce fine lines and wrinkles- keeping your skin young and healthy looking! It is also rich in antioxidants, which can help to neutralise the effects of harmful free radicals.